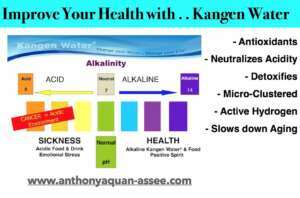 Kangen Water® – ANTHONY AQUAN-ASSEE, M.Ed., B.Ed., B.Sc. Kangen Water® is the healthiest and most delicious type of water. 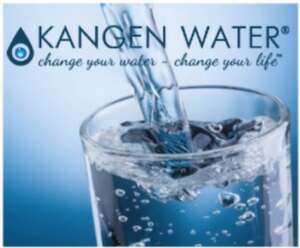 Kangen Water is Antioxidant-Rich, Healthy, Alkaline Water to strengthen your immune system and fight the aging process. – This water has a raised pH because of the process of electrolysis which the water undergoes in the Water Ionizer. This helps neutralize the acidic toxins and balances the body’s pH, making it more alkaline. – It helps prevent diseases as the body is stronger and better equipped to grow and repair the cells. – This water is one of the most powerful antioxidants known. The antioxidant properties of Kangen water are gigantic and are about 30 times greater than that with Green Tea. – Kangen water is full of important minerals such as calcium, sodium, potassium and magnesium. 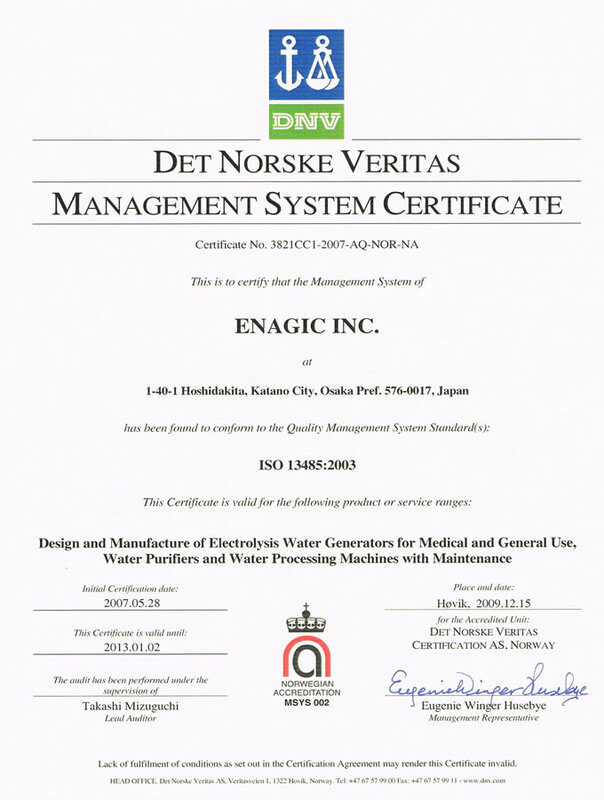 – It is made by Enagic, one of the leading manufacturers of high quality water ionizers in Japan. – Is recognized as as an approved medical device in Japanese Hospitals by the Japanese Ministry of Health, Labor and Welfare. Click here for the proof of licensing as a Medical Device. – A healthy life begins with healthy Kangen water. 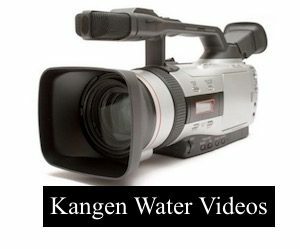 See below for videos about Kangen Water® and other beneficial uses. 1) Sleep problems and low energy. 2) Other problems associated with a brain injury. 3) Cancer – I was diagnosed four years and I am still cancer free !! 5) Skin problems such as acne, dry skin, psoriasis, eczema. Japanese Association of Preventative Medicine for Adult Diseases. 2) Certified medical device by Japan’s Ministry of Health and Welfare. 3) Used in hundreds of hospitals in Japan. 4) Lifespan of 15 – 25 years (Save more in the long run compared to other water ionizers). 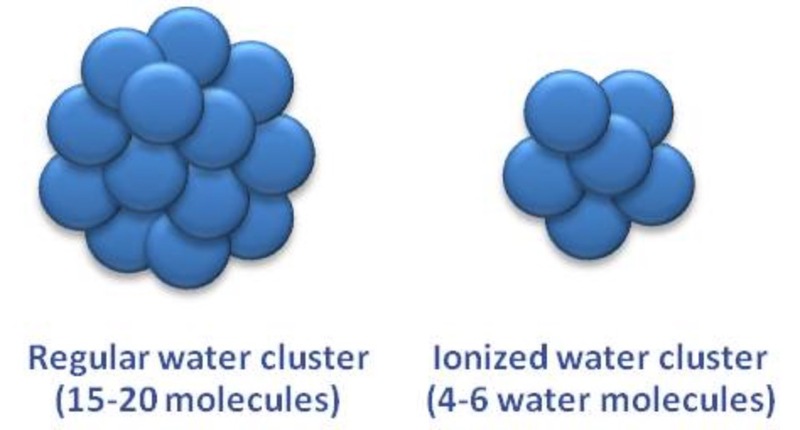 5) Micro-cluster of water molecules for better hydration and absorption (4 – 6 per cluster) compared to regular water (15 – 20 per cluster). 6) Use of medical grade titanium plates hand-dipped with platinum (instead of mesh technology used by competitors) to prevent chemicals from leaking into water. 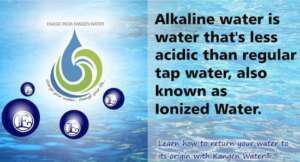 1) Alkaline: The Alkaline minerals in Kangen Water are used to neutralize the acidic toxins in the body. Kangen Water raises the pH of your drinking water. It does this by ionizing or splitting the water molecule (H2O) resulting in the ions H+ (hydrogen with a positive electrical charge), and OH- (hydroxyl ion with a negative electrical charge), as well as ionic alkaline minerals. This abundance of OH- ions increases the bicarbonate buffers in the blood, balancing the pH of the body and neutralizing and excreting acids and toxins. 2) Anti-Oxidant Free Radical Scavenging: Ionized alkaline water supports the wellness of bodily organs while promoting the health of those same organs. Part of the reason for these benefits is that ionized alkaline water is an anti-oxidant free radical scavenger. Studies have demonstrated a phenomenon identified as “micro clustering” which refers to the exceptionally small “restructured” molecules of alkaline water. The smaller Kangen water clusters are more able to penetrate the cellular membranes, enhancing tissue repair and waste removal. Ionized alkaline water is an excellent source of healthful hydration because not only does it taste better with a superior mouth-feel, it is more readily absorbed by the body. This increases the “drinkability” of water by reducing the usual feeling of being “bloated” from drinking the recommended daily allowance of 8 glasses per day. In side-by-side tests, most people can taste the difference! Kangen Water® contains an abundance of hydroxyl ions (OH-) which donate free electrons to unstable oxygen free radicals, resulting in stable oxygen molecules. According to experts, drinking Kangen Water® on a regular basis will increase the amount of dissolved oxygen in the blood. Stable oxygen provides us with more energy and mental alertness. Try it out. What do you have to lose ? Change Your Water, Change Your Life. Water is the universal solvent that our bodies rely on for flushing toxins and waste products from the body. With its negative oxidation reduction potential (ORP) and great taste, you can count on ionized alkaline water such as Kangen Water® to aid in the neutralization of free radicals and address all of your body’s hydration needs. Kangen Water® is formed from an electrolysis process which separates ordinary water (H2O) into two separate streams. Half of the separated water becomes acidic with an abundance of (H+) molecules, while the other becomes alkaline with an abundance of (OH-) molecules. 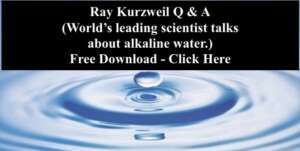 The alkaline (OH-) Kangen water is used for drinking purposes. 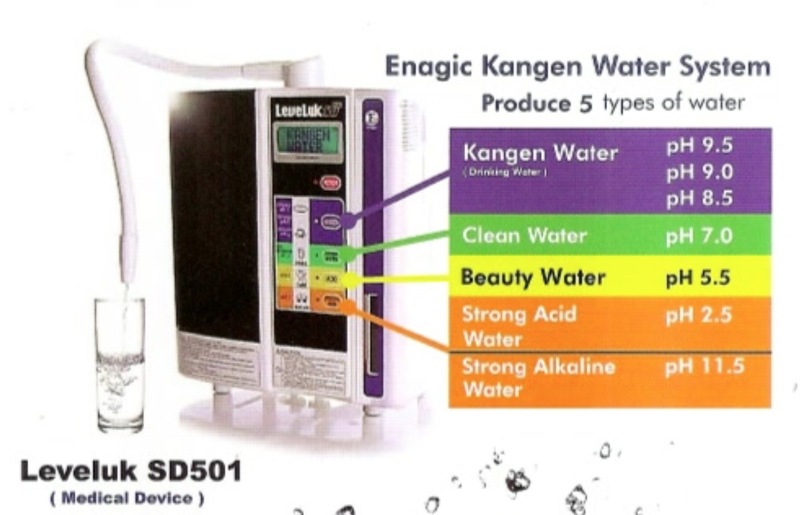 The Enagic Leveluk SD501 is considered the ‘Gold Standard’ in all water ionizers. The water ionization process in this machine is able to do something that matches what is done in nature. The water becomes super hydrating, it becomes water that is loaded with anti-aging antioxidants, and it becomes water that detoxifies, flushing toxins and acidic wastes out of our cells like nature’s water was intended to do. Removing toxins and acidic wastes from the body greatly improves one’s health. The ultimate goal for many of us is to reach our best level of health. We may try to eat healthy, exercise regularly, and take numerous health supplements but we may still not feel that we are at our optimum level of health. Many health problems we experience are caused by mild acidosis. This is a condition when your body fluids contain too much acid. Acidosis occurs when your kidneys and lungs can’t keep your body’s pH in balance. Kangen Water® can improve this condition. When your body is too acidic, it will start taking important minerals from your bones and vital organs to neutralize the acid, which is then eliminated from the body. The loss of important body minerals such as calcium, sodium, magnesium and potassium can go on for some time until it reaches unhealthy levels, causing acidosis. Health problems caused by mild acidosis include: headaches, fatigue, sleep problems, low energy, migraines, confusion, poor concentration, emotional problems, obesity, diabetes, asthma, arthritis, muscular aches, neck pain, back pain, knee pain, joint problems, eczema, psoriasis, acid reflux, high blood pressure, and high cholesterol. How to improve your Alkalinity ? 1) Drink plenty of Kangen Water® (alkaline water). 2) Regularly check your pH. 3) As much as possible, avoid acidic foods and drinks. Drinking Kangen Water® will fight acidosis by helping your body flush out toxins and acid from your body. It will slow the aging process; increase the absorption of vitamins and minerals as well as oxygenating your blood. Kangen Water® can change your life if you are dealing with health problems. Return to what is Natural – Alkaline Water ! 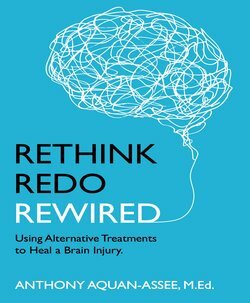 The Japanese take a different perspective on disease and how to treat it. They consume the right kinds of fluids and foods and as a result it is reported that they are one of the longest living people on the planet. Enagic has sold over 400,000 water ionizers in Japan alone. The word ‘Kangen’ is a Japanese word that means, “Return to Origin” and is referring to the process of turning our bodies back to more of an alkaline state much like the time when we were very young. In Japan, the Enagic water ionizers are considered medical devices and used throughout Japan in their hospitals. These devices filter your tap water to ensure that you have clean and delicious water. With a pH of 8.5 – 9.5, this type of water is perfect for drinking and healthy cooking. It works to restore your body to a more alkaline state, which optimizes health. This will improve the quality of your life. Start your day with Kangen Water®.